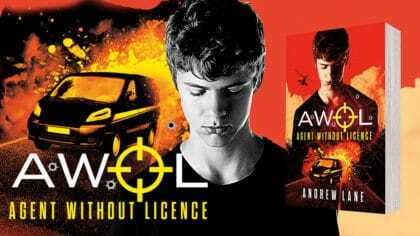 Check out AWOL: Agent Without Licence, a brand new book from Andrew Lane! If you’re a fan of the Young Bond and Alex Rider series, we’ve got something really cool to share with you! It’s a brand new book by Andrew Lane, author of the Young Sherlock Holmes series. He also used to work in the Ministry of Defence which is perfect because his brand new book is all about spies! The book is called AWOL: Agent Without Licence and it’s out right now. In the book, Kieron and his friend Sam are shocked to see a man kidnapped in a Newcastle shopping centre right in front of their eyes. Kieron has accidentally stumbled upon the undercover world of Bex Wilson – a freelance agent working for the British Secret Intelligence Service. Without her handler Bradley (the man who was kidnapped), Bex is in trouble! Before Kieron and Sam know it, they are part of a mission to stop a weapon of mass destruction from falling into the wrong hands. AWOL: Agent Without Licence is out now. The second book, AWOL: Last Safe Moment, is out in October. Kieron looked around wildly, trying to find anything that might help. His gaze snagged on the car keys, which had a BMW key fob on them, and a plan formed in his mind so quickly it was as if it had always been there and a spotlight had suddenly been shone on it. He snatched the keys up and quickly moved to the far side of the Delica. The keys had two buttons for remotely locking and unlocking the car outside. If they were anything like his mum’s car keys then pressing the ‘lock’ button twice would set off the car alarm. So he pressed the ‘lock’ button twice. Outside, the BMW’s horn started to blare. Flashing lights illuminated the night. As Kieron hid, the first man ran out of the warehouse, through the garage area past the van, and outside to see what had set off the alarm. Kieron dropped the car keys, snatched a knife and a handful of plastic cable ties from the toolbox and ran into the warehouse, pulling the door shut behind him. He moved quickly to Sam’s side and sliced through the cable ties that were securing him to the chair. Outside, the BMW’s alarm abruptly stopped. Kieron cursed himself. He should have kept the keys. While Sam moved across to the other chair, Kieron quickly strung together the extra plastic zip ties into a chain about six feet long. The door to the garage area rattled: first slightly, then heavily. Seconds later the entire wall shook as someone wrenched at the handle. Kieron knelt down and, working fast, passed the chain he’d made through the struts of the metal shelving on either side of the door. He made sure the ties were tight, and set at about ankle height. Standing up, he saw that Sam had pulled Bradley from his chair. The man appeared woozy, but he seemed to understand what was going on. As Sam helped Bradley away, Kieron grabbed the two chairs, dragged them to the doorway and turned them over so that their metal legs pointed upward, and towards the door. Once he felt happy with the placement, he checked that Sam and Bradley couldn’t be seen and followed them. He’d only just got to the nearest crates when the door to the garage area burst open. The second man had obviously returned, and the two of them had used the metal table to smash the door. They threw the table behind them and came through the doorway together. They were holding guns. Kieron caught his breath in shock. They were actually holding guns. The first man, the one who had menaced Sam, hit the stretched cable ties first. His feet stopped while the rest of his body kept moving. His face contorted in surprise as he toppled forward. His friend was only a moment behind him. He stumbled over the first man, rather than the cable ties, but they both fell into the warehouse. And into the upturned chairs. Grunts of surprise turned to cries of pain as the metal legs hit their faces, their shoulders and their ribs like so many blunt spears. They tried rolling out of the way, but their arms and legs got tangled together and the chairs rolled with them, ending up in a confused mess of men and furniture. Both of them managed to hold on to their guns, however, which made Kieron curse. He’d been hoping to grab one of them at least. He sensed Sam behind him. ‘Have you got the knife?’ he whispered. ‘Not much use against guns,’ Sam whispered back. ‘Depends how you use it.’ Kieron reached a hand backwards and felt the handle of the knife being pressed into his palm. He waited while the two men disengaged themselves from the chairs with a lot of swearing and climbed unsteadily to their feet. The first man had a long line of blood beneath his left eye. The second man held his right arm as if the shoulder was damaged. They both looked very, very angry. Actually, they both looked like they were going seriously insane with rage. Kieron reached his arm backwards and threw the knife across to the other side of the warehouse. It spun through the darkness, arcing above the concrete floor and hitting a pile of crates with a clatter. ‘Over there!’ the second man said, pointing. With him under one of Bradley’s shoulders and Sam under the other they scooted across the ground, with Bradley sometimes helping and sometimes allowing himself to be dragged. They got to the door into the garage area without being spotted. The door was wrecked, so unfortunately Kieron couldn’t close it behind them. He hoped it would take the thugs a while to realise they’d gone, but he wasn’t holding out much hope. ‘What now?’ Sam hissed as they got to the blue van. Between them, Bradley tried to struggle upright. For the first time since the shopping centre Kieron saw his face clearly, and he was shocked by the bloody cuts and dark bruises. ‘The van,’ Bradley said through bruised lips. Kieron reached out and tugged at the sliding side door of the van. It moved smoothly backwards, along the van’s length, on oiled runners. Quickly he and Sam helped Bradley get in, joined him and slid the door shut. They both hung back, each waiting for the other to get into the driver’s seat. Sam shook his head. ‘How do you ever intend getting a girlfriend?’ he asked.